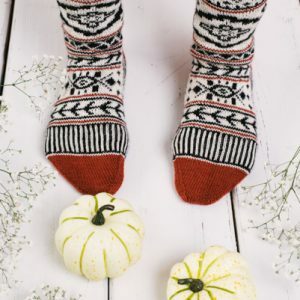 Keep your toes warm with these cozy knitting patterns for socks and slippers. 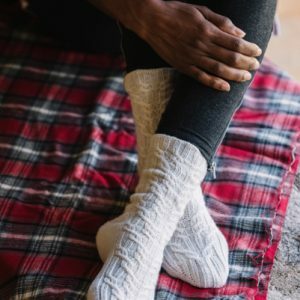 Find easy knitting patterns for scrap yarn slippers and shaped tube socks to knit. These socks are worked top down with a heel flap and gusset decreases. Instead of an evenly repeating stripe pattern, the contrast color is used with varying distance, giving thicker and thinner stripes of main color. Using garter sts in the vertical pattern panel along the front make an extra striping effect for the color changes. This design was created with this beautiful self-striping yarn blending some color favorites to get men some “flare” wearing their socks. 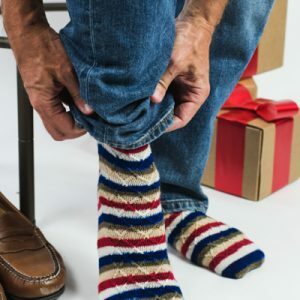 The simple diamond stitch pattern on the socks is reminiscent of a faux argyle that men so love to wear. Clark is the perfect gift for the classy, but spunky, gentleman. 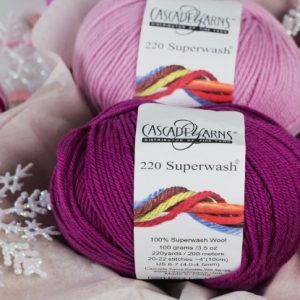 The Eve Slippers are super stretchy and comfy and that’s due in part to the Cascade Yarns 220 Superwash yarn – which you now have a chance to win! Sweet little slippers are a wonderful gift for Christmas, quick to knit and suitable for all generations. She’ll love the little bows on these sweet and versatile slippers. P.S. If you make a pair for yourself, these slippers will keep you warm as you wrap gifts on Christmas Eve! This unisex pattern is about to become your go-to pattern for socks. Classic and rich with cables, this delightful pattern looks great in a variety of colors. Inspired by windswept snowbanks, the Cecily socks feature a flowing, travelling cable pattern that runs up and down this classy design. There’s even a cute cabled detail at the back of each ankle for a unique twist! Inspired by the rich color combinations of Aztec and Southwestern motifs, these beautiful socks are perfect for a sock knitter in need of a bit of a challenge. Worked from the top down with a heel flap and gusset construction, these socks features a striking black and white pattern with rust cuffs, heels and toes.